Reifenhäuser Cast Sheet Coating has launched a new polishing stack model, MIREX-MT-HS for production of yoghurt cups, trays and similar products. Similar to its predecessor MIREX-MT, the mechatronic gap adjustment allows precise and fully automated process controlled by a 24″ touch screen panel. The vertical roll arrangement and smaller roll diameters in a range between 310mm and 510mm is able to produce polystyrene (PS), polypropylene (PP) and barrier films with output capacities from 400-1,200kg/h. Moreover, the MIREX-MT-HS polishing stack is able to produce under clean room conditions as the normally used hydraulic roll set-on system was replaced with a mechatronic system. 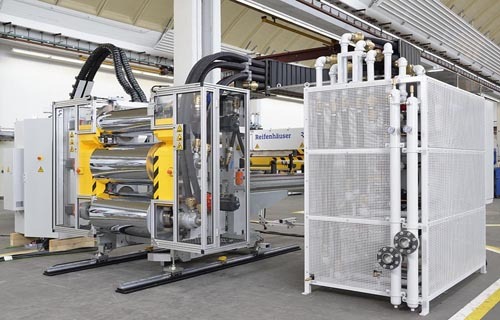 Reifenhäuser said the first machine was shipped to a European customer at the end of May. With a capacity of 800kg/h, it will produce 0.4-1.6mm thick PP films in a finished width of up to 850mm in a space-saving vertical roll arrangement. Its reproducible adjustment of the mechatronic system helps to produce optimum quality in a short time after product changeover, according to the company. A third model type of polishing stacks using a mechatronic roll set-on system will be presented by Reifenhäuser this year.